At Sugar Hill Resort, guests enjoy lots of extras like an on-site bar/restaurant, a fitness center, and a huge swimming pool. Sugar Hill Village E119 comes with its own set of perks, too! Guests love the comfort that this 3-bedroom townhome provides. There’s lots of space and privacy, as well as all the necessities of home. Guests can spend their time lounging on the sunny terrace, or relaxing in the shade. There is even a small plunge pool, perfect for cooling off after sunbathing. Best of all, Sugar Hill E119 is close to Holetown, so guests can easily shop, dine, and enjoy the island nightlife! Charming town home surrounded by beautifully manicured gardens! 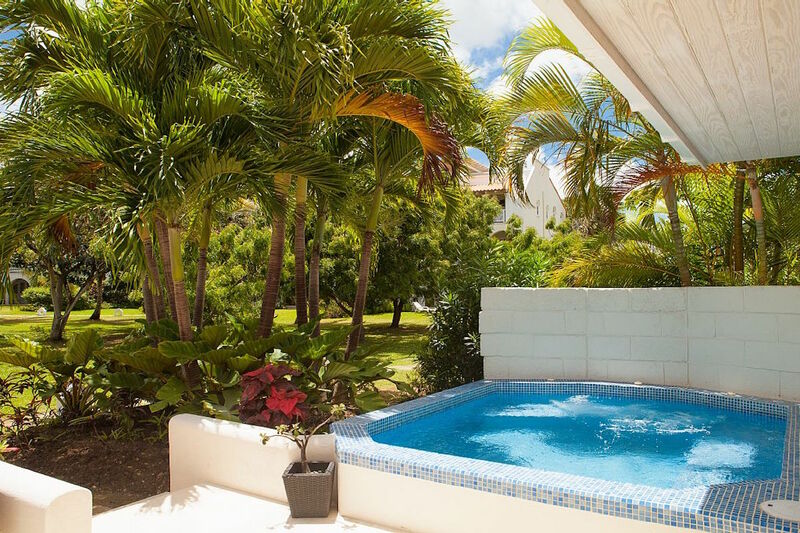 Sugar Hill Village E119 is a charming 3-bedroom townhouse located in the exclusive Sugar Hill Resort Community in St. James on the west coast of Barbados. The Sugar Hill Resort is a private gated community within 10 minutes of Holetown. E119 is located in the Tennis Village, surrounded by manicured gardens and a free-form communal swimming pool. This three-bedroom, two-bathroom house offers ample space and lots of amenities. All bedrooms have ceiling fans, and two of the bedrooms are air-conditioned. The villa has been furnished to the highest of standards, and the open plan living areas lead onto the terrace and private plunge pool. The kitchen is well-appointed with granite work tops and modern appliances. The large downstairs terrace has sun loungers, a covered lounge area, and a covered dining area with a charcoal barbeque for alfresco meals. At Sugar Hill, you will have full use of the on-site facilities. These include an open plan club house with a restaurant and bar, four floodlit tennis courts, an air-conditioned fitness center, and a 2,000-square-foot swimming pool. Bedroom 4: Beds can be prepared as a king or two twins with advanced notice.